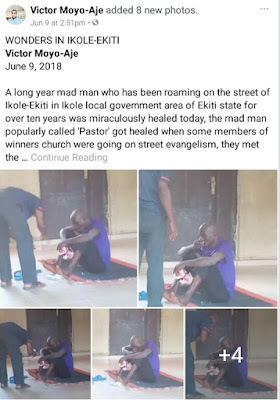 According to reports, an evangelist in the local government area of ​​Ikole in the state of Ekiti healed a mentally disabled man known as 'Pastor' on Saturday. 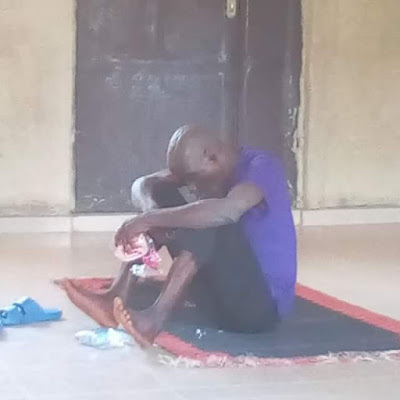 According to reports, the mentally unstable man has been wandering the streets of Ikole-Ekiti for the past 10 years. The news shared by Victor Moyo of Ekiti has left languages ​​moving on social networks. After his supposed healing, he was given a bath and a haircut and later identified as Adekunle Akomolafe of Akure. Read below: "A year-old crazy man who has been wandering in the street of Ikole-Ekiti in the Ikol local government area of ​​Ekiti state for over ten years was miraculously healed today, the madman popularly called 'Pastor' 'He was healed when some members of the church of the winners went to street evangelism, met the madman when he was lying on the side of the street and stood up and asked them to pray for him, a woman among the evangelists prayed for he and then the madman said that they should talk about their hair to him, what they did in the presence of many people who had gathered to witness what was happening.